First impressions matter. Make them count. Generate 140% more impressions by leveraging on your audience's voice. Capture content with our social media aggregator that can be tailored to fit your every campaign need. 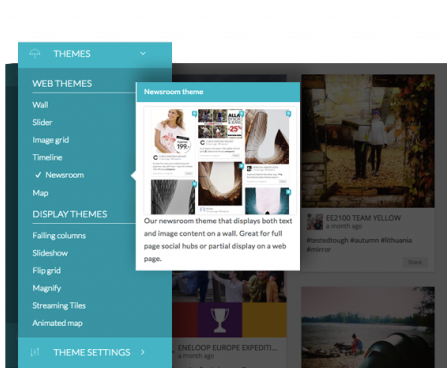 Create your own social hub from 10+ different sources such as Instagram, Facebook and Twitter feeds. Enjoy powerful filters, automatic profanity and spam scans, and the ability to hide negative posts. 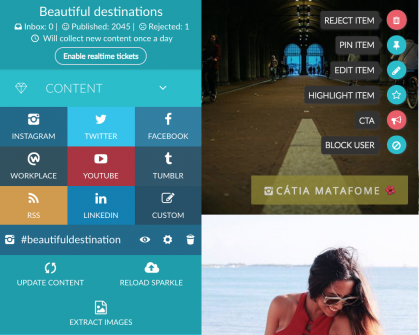 Design your social hub in any way that you wish with beautiful themes and custom CSS options. Your social media campaign. Your look. Your decisions. Focus on your social media campaign strategies and get your social hub live in minutes. "Sparkle proved to be the perfect tool for our campaign. It saved us a lot of time and money. It allowed us to customise post layout easily, allowing us to maintain our corporate identity. We could also add “shoppable buttons” to social posts which were interesting for us and our sponsor"